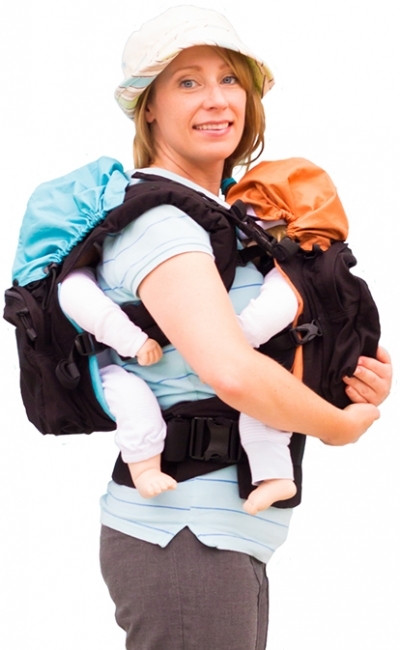 TwinGo Carrier—the first ergonomic twin baby carrier—is 3 products in 1: a twin carrier for 1 adult to carry 2 babies and can split into 2 single carriers for 2 adults to carry 1 child each on their front or back (patent pending). TwinGo Carrier’s innovative design features two contoured seats to individually support two babies in an ergonomic inward-facing position and maintain healthy hip and spine positioning. The revolutionary carrier connects the two seats to a single set of padded shoulders straps reinforcement for tandem wearing one baby in the front and one baby in the back. The interlocking lumbar waistbands are fully adjustable to ensure comfort for parents and designed to be worn at variable heights to keep both babies close and visible. A bonus feature is the option to convert the TwinGo into two separate ergonomic carriers by adding a second set of padded shoulder straps, allowing two parents to carry one child each on the front or back. The carrier sports two adjustable, removable sleep hoods and extra-large pockets to store diaper bag essentials or fold the entire carrier inside for compact storage. In 2010 tandem babywearing in two baby carriers empowered Krystal Workman to keep her twins close while still having hands free to multitask. Since nothing on the market fit Workman’s exact needs, in 2011 she decided to make her own DIY twin carrier that was efficient to use with comfort and ergonomics in mind. In 2012 Workman filed for a patent and founded TwinGo LLC. Today TwinGo Carrier is enabling thousands of parents across the US and worldwide to keep their children close.